WASHINGTON – President Donald Trump said Thursday the United States will withdraw from a global agreement on emissions that “handicaps” the economy, a move that Arizona critics charged will end up harming both the economy and the environment. 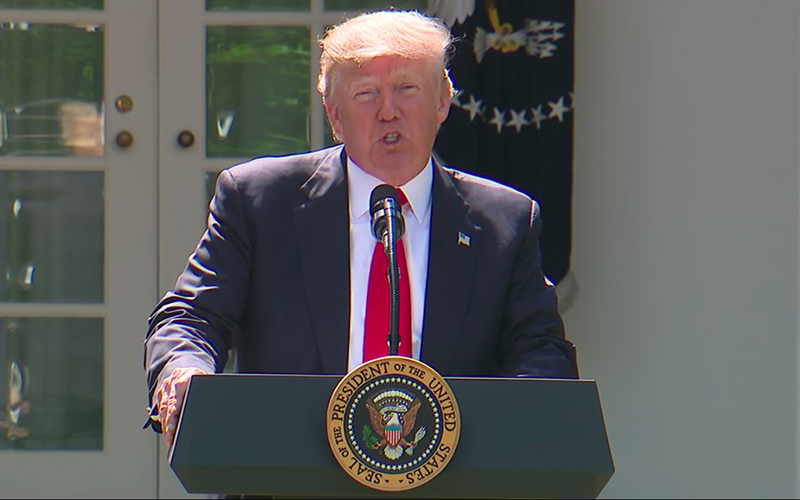 Trump’s long-expected announcement pulls the U.S. out of the so-called Paris climate accords, which set goals for reducing emissions in every country but Syria and Nicaragua in order to slow the rise of average global temperatures. He said in a Rose Garden ceremony that the pact is too costly for the degree of climate improvements it would bring, and that it handicaps the U.S. economy. “I will work to ensure that America remains the world’s leader on environmental issues, but under a framework that is fair and where the burdens and responsibilities are equally shared among the many nations all around the world,” Trump said. One environmental group called the president’s reasoning “divorced from reality and morality,” and Arizona Democrats said environmental protection is too important to walk away from. “The administration puts its head in the sand, pretends climate change doesn’t exist and then blocks the development of alternative energy,” said Rep. Raul Grijalva, D-Tucson. But Republicans praised Trump for standing up for American interests by rejecting the accord that was agreed to by former President Barack Obama. “Withdrawing from the agreement shows the American people and the world that he means business, follows through on his promises and puts America first,” said Rep. Paul Gosar, R-Prescott, in a statement released by the Congressional Western Caucus. Gosar, who chairs that caucus, said the return on investment was not enough to justify the cost of the deal. “Ringing up with a price tag of nearly $1 trillion a year to reduce the average global temperature by one-third of one degree, this bad investment defied common sense with embarrassing returns,” he said. “I don’t care what shade of lipstick you put on this pig, at the end of the day it’s still a pig and I’m glad to see this out-of-touch pipedream put out to pasture once and for all,” Gosar’s statement said. Trump signaled a willingness Thursday to sit down with Democratic leaders and negotiate a return to the treaty, but only if he can get what he thinks is a better deal for the U.S.
“So if the obstructionists want to get together with me, let’s make them non-obstructionists,” Trump said, apparently referring to Democratic leadership. In a joint statement Thursday, however, the leaders of Germany, Italy and France expressed doubt that renegotiation was a real possibility. “We deem the momentum generated in Paris in December 2015 irreversible and we firmly believe that the Paris Agreement cannot be renegotiated, since it is a vital instrument for our planet, societies and economies,” the statement said. The accord is voluntary and non-binding, so there are no penalties for withdrawing or for not meeting emissions targets. Arizona environmental officials said the state is already on track to beat emissions goals set under the Environmental Protection Agency’s Clean Power Plan, and they welcomed the reduction in regulation that will result from the U.S. leaving the Paris accords. The deal, negotiated during the Obama administration, also drew criticism from Republicans who said Obama should have involved Congress. The Constitution delegates to the Senate the power to sign treaties on behalf of the nation. “This agreement was the capstone of the Obama administration’s attempt to circumvent the constitutional powers of Congress,” said Rep. Andy Biggs, R-Gilbert, in a statement praising Trump’s decision. But Phoenix Mayor Greg Stanton said mayors are prepared to lead the fight on climate change if the White House is not. “America has to be a leader on this issue,” said Stanton, one of close to 70 mayors across the country pledging to have his city adhere to the standards established by the Paris agreement, whether the U.S. remains in the pact or not. “So if President Trump is going to abdicate leadership, mayors like myself and throughout the country, we’re going to step in and fill the void,” Stanton said. Michael Brune, executive director of the Sierra Club, said in prepared statement that low-income Americans will be hardest hit by what he sees as the environmental damage that will come out of Trump’s decision. -Cronkite News reporter Lilia Calvillo contributed to this report in Phoenix.